Cleveland’s first zoning code was written in 1929, and since then it’s been amended in ways that have eroded the walkability of the city. City leaders acknowledge that building compact, mixed-use neighborhoods has basically become illegal under the current zoning code. But in an exciting development, Cleveland is looking to overhaul its regulations to make the city a better place to walk. City planners told the Plain Dealer that the process will require a “culture shift” to a more urban, less suburban mindset. Cleveland City Council President Kevin Kelley kicked off the meeting, remarking that the Market District in Ohio City and East 4th Street downtown are where locals take visitors to impress them. But red tape in the zoning code prevents new developments from having the close geometries and design elements that produce a feeling of vibrancy in those postcard locales. A form based code will translate pages of text into illustrations of good urban form, Reisz adds. The idea is to remove barriers and encourage buildings that meet the street, place parking behind, and require a generous supply of windows and doors at the ground level. The zero setback, mixed use building is currently illegal, he said. The award-winning Uptown development, for instance, required variances. The city has evolved its thinking about zoning. When the current code was written in 1929, separating factories from residents was top priority. 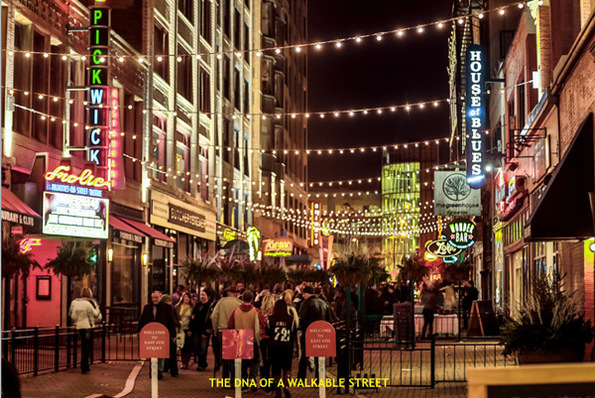 Most Clevelanders were pedestrians, so little was written into the code about preserving the walkable character of the city, said Reisz. Later amendments to the code discouraged walking while enhancing the street and built environment to aid motorists. Town homes at W. 58th Street and Bridge Avenue with parking garages at ground level create a big driveway instead of a sidewalk. An Aldi’s grocery store surrounded by a big parking lot versus the same store built under a form based code — built to the street with big windows, a front door and parking behind. “The goal is, what you need to do is reachable by foot,” he explained. “It’s more sustainable because you don’t have to drive and put pollutants in the air. And its more equitable because you don’t need to own a car. It also allows RTA to operate more efficiently” (because less parking and more density usually results). Elsewhere on the Network today: Broken Sidewalk reports that Louisville, a city with a serious pedestrian safety problem, is trying to address it using signals that give walkers a head start. And The City Fix reports on an international summit that drew city leaders together to discuss how to reduce vehicle emissions.